What an amazing read! Once I started reading it, I could not put it down. Greatest Debtor is filled with stories of mind-numbing obstacles that are overshadowed by the power of a super natural faith. Why has the extraordinary life of Ngozi Okike attracted attention from the BBC to the extent of her life’s ‘adventures’ being a BBC recorded feature? 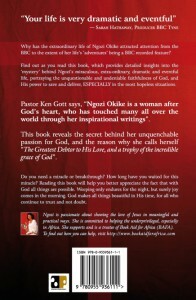 Find out as you read this book, which provides detailed insights into the ‘mystery’ behind Ngozi’s miraculous, extra-ordinary, dramatic and eventful life, portraying the unquestionable and undeniable faithfulness of God, and His power to save and deliver, ESPECIALLY in the most hopeless situations. 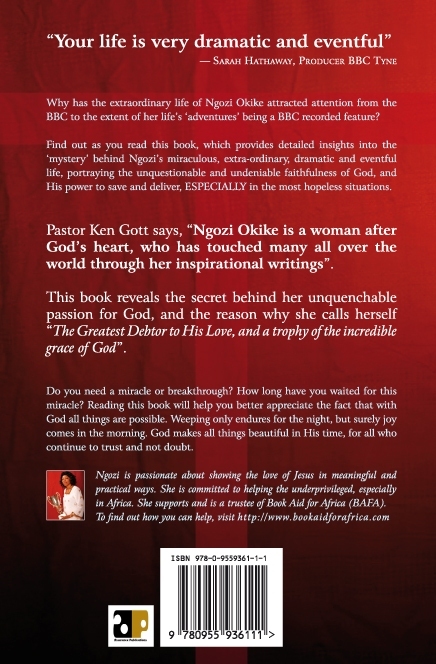 Pastor Ken Gott says, “Ngozi Okike is a woman after God’s heart, who has touched many all over the world through her inspirational writings”. This book reveals the secret behind her unquenchable passion for God, and the reason why she calls herself “The Greatest Debtor to His Love, and a trophy of the incredible grace of God”. Do you need a miracle or breakthrough? How long have you waited for this miracle? Reading this book will help you better appreciate the fact that with God all things are possible. Weeping only endures for the night, but surely joy comes in the morning. God makes all things beautiful in His time, for all who continue to trust and not doubt. 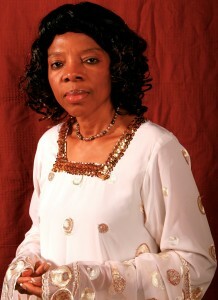 Dr. Ngozi Okike is a woman after God’s heart, who has touched many all over the world through her inspirational writings. With almost 45 years of Christian ministry she is an evangelist, prophet and teacher of the word, with an unquenchable passion for God and for the lost. In obedience to the Lord she is publishing some of her writings to make them more accessible to many and to continue to bless lives all over the world. Ngozi is currently serving under the ministry of Pastors Ken and Lois Gott, whom the Lord has used over the past 10 years to continue to mould her life to make her the woman God has called her to be. In addition to serving the body of Christ at Bethshan Church, Ngozi has served in the Higher Education sector for over 33 years. She is committed to helping the under privileged, especially in Africa. She supports and is a trustee of Book Aid for Africa (BAFA). To find out how you can help, visit the Book Aid For Africa website. “My soul magnifies the Lord, and my spirit rejoices in God my Saviour. For He has regarded the lowly state of His maidservant; for behold, henceforth all generations will call me blessed. For He who is mighty has done great things for me, and holy is His name” (Luke 1: 46-49). In Luke 7: 36-47 we read “And behold, a woman in the city who was a sinner, when she knew that Jesus sat at the table in the Pharisee’s house, brought an alabaster flask of fragrant oil, and stood at His feet behind Him weeping; and she began to wash his feet with her tears, and wiped them with the hair of her head; and she kissed His feet and anointed them with the fragrant oil. Now when the Pharisee who had invited Him saw this, he spoke to himself, saying, ‘This Man, if He were a prophet, would know who and what manner of woman this is touching Him, for she is a sinner’. And Jesus answered and said to him, ‘Simon, I have something to say to you’. So he said, ‘Teacher, say it’. ‘There was a certain creditor who had two debtors. One owed five hundred denarii, and the other fifty. And when they had nothing with which to repay, he freely forgave them both. Tell Me, therefore, which of them will love him more?’ Simon answered and said, ‘I suppose the one whom he forgave more’. And He said to him, ‘You have rightly judged’. Then he turned to the woman and said to Simon, ‘Do you see this woman? I entered your house; you gave Me no water for My feet, but she has washed My feet with her tears and wiped them with the hair of her head. You gave Me no kiss, but this woman has not ceased to kiss My feet since the time I came in. You did not anoint My head with oil, but this woman has anointed My feet with fragrant oil. Therefore I say to you, her sins, which are many, are forgiven, for she loved much. But to whom little is forgiven, the same loves little”. As I look over my life and see where I’m coming from and all that the Good Lord has done for me, and how so undeserving I am, I can rightly say that I am like the woman in Luke 7. I have been forgiven much more than I can even remember. The Lord has done so much in this life that even if every strand of my hair was converted into tongues, they can never compensate for the debt of love that I owe. Hence I regard myself as The Greatest Debtor to His Love, and a trophy of the incredible grace of God. We all know how we feel when someone sends us a Thank You card, writes us a letter of appreciation or makes that phone call to say ‘thank you’. Jesus also alluded to this when He healed ten lepers (Luke 17: 11-19) and only one (a Samaritan) came back to say thank you to Him. Jesus loves it when we have a thankful heart. Like the woman in Luke 7, this book is my ‘Alabaster Box’ containing precious ointments of my appreciation for His immeasurable love and faithfulness throughout my life. Through this INSPIRATIONAL book, I wash His feet with my tears of gratitude and wipe them with my praise; I kiss His feet with my songs of deliverance, and anoint them with my oil of worship, like fragrance pouring from my soul. I had a real problem deciding what would be an appropriate title for this book. Should it be called My Alabaster Box? Or should I call it From a Thankful Heart, or A Debtor to His Love? Or should it be A Trophy of His Grace? It was difficult to decide. In the end the Holy Spirit gave the inspiration to call it not only A Debtor to His Love, but The Greatest Debtor to His Love … and a Trophy of His grace. Indeed, I regard myself as the greatest debtor to the love of God and a trophy of what the grace of God can accomplish in the life of a person. I may never fully comprehend why the Lord loves me the way He does, but one thing is certain, I AM EXTREMELY GRATEFUL for EVERYTHING He’s accomplished in my life. This book is my ‘Thank You’ card to the Lord for all He’s done, is doing, and will yet do in my life. I’m aware that it would be impossible for me to put down in this book everything He’s done. So, like King David in Psalm 139: 17-18, I declare ‘How precious also are your thoughts to me, O God! How great is the sum of them! If I should count them, they would be more in number than the sand …’ David was a man who knew how to love and appreciate God Hence the Bible describes him as a man after God’s own heart. In Psalm 105: 1-3 he said “Oh, give thanks to the Lord! Call upon His name; MAKE KNOWN HIS DEEDS AMONG THE PEOPLES! Sing to Him, sing praises to Him; TALK OF HIS WONDROUS WORKS! Glory in His name; let the hearts of those rejoice who seek the Lord!”. Indeed, this book is my attempt to make known His incredible deeds in my life and to talk of His wondrous works. I believe that everyone who reads this book cannot but rejoice and appreciate this Great and awesome God, to whom I’m privileged to belong. He’s my Father, and I love Him with an incredible passion. In this book, I’m breaking my ‘alabaster box’ of gratitude and asking everyone who reads it to join me in praising God. I also believe that for many who are trusting God for a miracle or breakthrough in their lives, after reading this book, they’d be strengthened in their faith and encouraged to believe that with God all things are possible. Weeping only endures for the night, but surely joy comes in the morning, and I’m a living testimony to that. God makes all things beautiful in His time, and I believe that for all who will continue to trust and not doubt, God will come through for them because He’s faithful, and will reward those who diligently seek Him. Wow! What an amazing book! 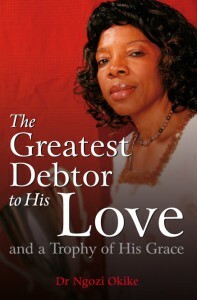 "The Greatest Debtor to His Love and a Trophy of His Grace" is a book so wonderfully written. It brought to my attention that one should trust in the Lord always no matter what our troubles may be. Thank you for writing such an inspiring book Aunty Elewechi. We are so proud of you. Thanks for sharing your experience with us, it was an eye opener. It brought to light Psalm 23 verse 4 NIV (Even though I walk through the darkest valley, I will fear no evil, for You are with me; Your rod and Your staff, they comfort me). 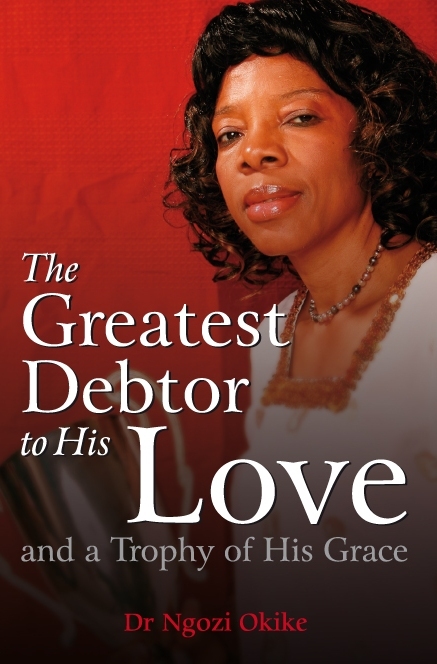 Dr. Ngozi E .OKIKE shared the story of her life in \'\'THE GREATEST DEBTOR TO HIS LOVE AND A TROPHY OF HIS GRACE\'\' and one cannot but marvel at the demonstration of God\'s power her life. Today , she has a story and a song because she relied on her GOOD SHEPHERD to see her through the many trials and tribulations contained in the book . I have no doubt that hearts and lives would be touched through this book and if anyone is wondering if GOD is still in the business of miraculously delivering His own, this book is for you !!!!!! !